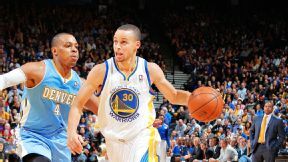 OAKLAND, Calif. -- The Golden State Warriors were certainly lacking something in their 123-116 Wednesday night loss to the Denver Nuggets. Toney Douglas had not helped the team much all season, but ironically, his services were sorely needed on the day he was swapped in a trade for Jordan Crawford. Douglas is an ace point guard defender who has lacked for opportunities to play alongside Stephen Curry. The Nuggets would have been perfect for Douglas, as they're rich in point guard-sized talent and supersmall lineups. In Toney's absence, Nate Robinson and Randy Foye set Oracle alight for 45 points on 24 shots. Perhaps nobody could have defended Nate Robinson on this evening, though. The buoyant guard hit an array of absurd off-balance shots, sinking six in the final quarter. This display was a reminder of the games Robinson could summon as former leader of Golden State's bench offense attack. "That's what Nate can do," Nuggets coach Brian Shaw declared. "He can bring that. He can get hot at any time. He's a streaky player, and when he's on a good streak, he's as good as anybody in the league." Robinson's offensive outburst was illustrative of what Golden State lacks and what it seeks from the trade market. Though the Warriors did not trade for Robinson, they did make a deal for Crawford, a gunner of comparable reckless confidence. Is Crawford, of all people, the savior of a title contender? On its face, such a possibility seems as ludicrous as Golden State's title contention status. But the Warriors boast the league's best-performing starting lineup, and Crawford has evolved as a playmaker. For now, the bench is Golden State's glaring flaw. "We're 29th in bench production," Warriors general manager Bob Myers said before the game. "It's safe to say we couldn't be worse." Myers' bench lacks guys who can dribble and create shots. Though Crawford, like Robinson, can produce maddening results, there is value in being the right kind of gunner amid guys who can't get their own offense. The Warriors aren't blaming this one on a lack of Crawford or a lack of Douglas, not when they coughed up a winnable home game. Curry played well for most of the night, but with 51 seconds left and his team trailing by three, Curry dribbled the ball of his knee and into the hands of J.J. Hickson. The turnover quickly became a game-sealing dunk on the other end. "Just a bad possession at the end, trying to do too much at the top of the key," Curry said. "Just a bad game all around." That turnover came at a terrible moment, but the game swung on Denver's offense destroying Golden State's defense. The Nuggets claimed 40 more points than field goals attempted, running through and around loose Warriors pick-and-roll coverage. The normally sanguine Mark Jackson was quite unhappy with his team's defensive performance. "They scored in the paint. We couldn't control or contain the pick-and-rolls. Just a bad, bad display by us," he said. Jackson elected to play Andrew Bogut for little more than a minute in the fourth quarter, favoring a small defense against the short Denver lineups. The Warriors scored well enough with Bogut seated, but they also ceded easy layups and crucial rebounds to an energetic Denver team. The Warriors won't blame anyone but themselves for a nationally televised home loss, and Crawford probably won't help them address the defensive lapses they suffered. Still, they need a player who can carry the bench on an evening when the opponent can't miss. Having lost to an incandescent Robinson, the Warriors seek to thrive going forward with a gunner of their own. Ethan Sherwood Strauss writes about the NBA at Warriors World, part of the TrueHoop Network. MVP: James Johnson. With Marc Gasol scoreless and largely ineffective in 14 minutes, Dave Joerger turned to a hyperactive front court of Ed Davis and Johnson to start the fourth quarter. Johnson responded by totaling 15 points, 6 rebounds, 5 assists and 6 blocks. X factor: In a game that also featured Giannis Antetokounmpo and Nick Calathes, Kosta Koufos won the mini-Olympiad of being the best of the Greek trio. His strong play (10 points, 4 rebounds, 3 assists, and 2 blocks) was most noticeable when the Grizzlies were jumping out to a 25-11 lead. That was ... icy: The Bucks stumbled through droughts of 15 and 11 consecutive missed field goals when Brandon Knight was resting on the bench. Knight, the only non-frigid Buck, scored 27 points on 10-of-17 shooting. MVP: James Harden took his time, but once he got hot, he sustained that sizzle. He finished with 26 points, including 10-of-11 from the free throw line, and did a nice job getting everyone else involved in the action with his seven assists. Defining moment: With 28 seconds left and the game tied at 100, Harden received the ball 22 feet from the basket. Austin Rivers, unfortunately switched onto Harden, apparently did not strike fear into the heart of Houston's guard, as Harden sank the go-ahead jumper over him. That was ... foul: The Rockets might play at one of the faster paces in the league, in terms of possessions, but the speed of some of their games can, at times, be glacial, due in large part to the fouls they draw. That was the case tonight, as Houston took 41 shots from the charity stripe, making 25. MVP: Following an off night in Indiana, Rudy Gay bounced back in a major way. Gay scored a season-high 33 points, 22 in the first half. He was also efficient in the victory, making 12-of-19 attempts from the field. Gay has now scored 20 points 11 times since joining the Kings. X factor: Derrick Williams played like a man who had tonight's game circled on his calendar. In his first game back in Minnesota since the Timberwolves traded him, the third-year forward was spectacular off the Kings' bench. Williams finished with 16 points on 7-of-11 shots. That was ... nearly given away. With a 102-91 lead late in the fourth quarter, the Kings looked like they were going to run away with this one. That wasn't so as the Wolves roared back to outscore the Kings 17-9 in the final 3:20 of the fourth quarter. MVP: Tony Parker. After a close first half, Parker came out blazing in the third quarter, scoring 12 of his 25 points as San Antonio built an 18-point lead. X factor: Kawhi Leonard. The walking X factor filled the box score in a way we've rarely seen in his young career, mainly because of his distribution. Leonard produced a 15-7-6-3-2 line that many Spurs fans hoped would be the norm this season. LVP: Marvin Williams. Williams started for the Jazz at the forward spot opposite Richard Jefferson and produced zero points in 21 minutes and finished with a minus-22. His backup, Enes Kanter, had 25 points and 11 boards. MVP: The Bulls had to hustle and grind to escape with a victory tonight, and no one hustles and grinds like Joakim Noah. He was up to his usual tricks, finishing with 26 points, 19 rebounds and six assists. It was his tenth consecutive double-double game. X factor: D.J. Augustin has been a revelation for Chicago. With a point guard that can drive a pick-and-roll attack, their offense looks transformed. He finished with 19 points and nine assists but more importantly, he controlled the tempo and kept the Bulls' offense above water. That was ... an electric display. Victor Oladipo couldn't lead the Magic to victory, but he was absolutely tantalizing. A series of one-legged fadeaways, treys, Rose-esque finishes netted him 35 points -- a career-high for Oladipo and a scoring high for rookies this season. MVP: Jared Sullinger has drawn probably overly optimistic comparisons to Kevin Love this season, but 25 points and 20 rebounds (including eight offensive) for Boston's young big man won't dull his high expectations at all. X factor: Sometimes a team takes good shots that miss. Toronto took bad shots tonight and -- predictably -- missed profusely, finishing 38.5 percent from the floor. The Raptors were also an atrocious 12-for-25 from the free throw line. That was ... a long time coming: The Celtics were winless in 2014 before Wednesday night. Their last W was a 103-100 victory over Cleveland on Dec. 28. Boston is 3-12 in its last 15 games. MVP: John Wall scored 25 points, notched nine assists, and when the game was in question late in the fourth, the "Game Changer" drew fouls on Norris Cole, found Nene for a poster slam over LeBron James, and iced it with a shimmy-shaking jumper. That was ... due. Coming into the matchup with Miami, Washington had only one win against a team with a record over .500. And they've heard about it. That their second came against a suddenly mortal Heat team will do wonders for the team's confidence. X factor: Experience. The Wizards scored 69 points before halftime, and the Heat looked like they were on malfunctioning autopilot. But coasting is a double-edged sword, and the Heat's slow, steady comeback brought them within single digits before the sprinting Wizards crossed the finish line. MVP: Despite the fact that his team ultimately lost an incredibly close game, Bobcats guard Kemba Walker still comes out as a winner. With 26 points and eight assists on 9-for-21 shooting, Walker kept the Cats' offense from being too stagnant through his ability to create his own shot off the dribble. Turning point: With Charlotte having a clear advantage on Philly as they entered the second quarter, the 76ers' transition game really started to get into gear. With the combination of Michael Carter-Williams and Spencer Hawes, Philadelphia was able to be a quicker team. That was ... ugly: Philadelphia's overall victory will most likely hide the fact that they finished the night with 24 turnovers. They ultimately ended the night by shooting 50.6 percent from the field but coach Brett Brown still has to be extremely disappointed by the sloppy play. J.J. Redick, Clippers: In his second game back after missing six weeks with a wrist injury, Redick scored a career-high 33 points, and the Clippers rallied from 17 points down with 4 1/2 minutes left to beat the Mavericks 129-127. Redick went 7-of-9 from 3-point range. Call it a White House hangover. Allen missed all five of his shots en route to a scoreless night in a 114-97 loss to the Wizards. This came on the heels of a 2-for-14 shooting night in a loss to Brooklyn. Tough 1 tonite..give Washington credit they put it on us..I must play alot better and we must play better..
"I don't want to just get out there and then get injured again. My thing is to make sure I can go out there and keep playing games. That's the plan and were sticking to it." -- Heat center Greg Oden, who returned to the court after more than four years recovering from injuries. 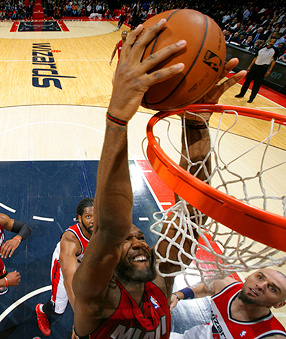 Ned Dishman/Getty Images Greg Oden returned to action for the first time in more than four years, posting six points and two rebounds in Miami's loss in Washington. Victor Oladipo, playing in the 39th game of his NBA career, scored a career-high 35 points for Orlando in its triple-overtime loss to the Bulls. Oladipo eclipsed the highest point total for a rookie in an NBA game this season (33 points for Michael Carter-Williams on Jan. 7) and became the first rookie to score as many as 35 points in a game for the Magic since Shaquille O'Neal (35 points vs. Philadelphia on April 6, 1993). MVP: Ty Lawson. The Nuggets only go as far as Lawson takes them and when he is running, penetrating, and dishing like he did tonight, their offense is extremely difficult to stop. X factor: Nate Robinson's fourth-quarter histrionics would have taken the cake here if it were not for J.J. Hickson's 24-rebound performance. In a game that featured heavy doses of small-ball, Hickson helped the Nuggets board their way to a win. Defining moment: With Denver clinging to a one-point lead late in the game, Hickson forced a Stephen Curry turnover and took it all the way down the court for a game-sealing flush. MVP: J.J. Redick sunk six first-half threes and finished the game with 33 points on only 14 shots. His seventh and final made three shortened the Mavs lead to 127-126 with 34 seconds left. X factor: Matt Barnes scored a season-high 25 points off the bench on an out-of-character 18 shots. He also pulled down seven boards and provided valuable off-ball movement and cutting when Dallas double-teamed Blake Griffin for most of the game. That was ... a swing set: No one knew where that game was going. The Clippers held a 100-91 lead only to see the Mavericks reel off a 32-6 run. But L.A. followed that up with a 23-6 run to close the game and seal the win. MVP: Scoring nine straight points down the stretch, LaMarcus Aldridge put the Blazers on his back. He finished with 32 points and 18 rebounds, his 22nd double-double of the season. Turning point: With 3 1/2 minutes left in the fourth quarter and the shot clock expiring, Aldridge beat the buzzer with a three, his first of the season. It began a 15-2 Blazers run. That was ... a close game -- until it wasn't: Before the final minutes, every punch the Blazers and Cavs threw was met with a counter. Neither team led by more than five until the Blazers held the Cavs scoreless over the final 2 1/2 minutes.